This is really bad timing and the trip had nothing to do with it, but unfortunately I’m afraid I need to do another half-now half-later comic for today due to some unrelated stuff that just so happened to pop up during my allotted “comic time”. You know how it gets. I’ll start on finishing it up as soon as I get home from work. I need a Yelling Bird or something for update filler. Also, in case you don’t remember Clyde. Very very VERY early in the comic's formation, I had a story arc idea where Selkie stays over at her grandparents, but nobody knew yet about her being carnivorous so they gently coerced her into eating vegetables, she got sick and they all felt very very bad. I pretty much killed the "grandparents don't know she's carnivorous" idea when I realized there was no good reason for that information not to be shared with them, but the base components of that arc became this bit. Poor Selkie. Poor Clyde! I’m wondering though – hasn’t Selkie ever been sick before? Surely the orphanage would have had some information they’d have passed along to Todd on what is safe for her? Presumably that’s one of the reasons why they’re calling Tod. However, I doubt that they know. You can’t just give her medicines and see what works, it’ll probably kill her. There may not be any medicine that’s safe for Selkie. Also, it occurs to me that although we’ve seen her get “flushed” no one has mentioned if Selkie has a fever (which she wouldn’t if she’s an ectotherm). There are some studies that say a fever helps the body to fight off infections so maybe the best way to help Selkie is to raise her temperature above normal for a while. Truthfully, Selkie being aquatic they should maybe be able to use the same kinds of medicines on her as you would use on fish. Maybe not, but at least it would potentially be less dangerous than trying human medicines on her. You did that. 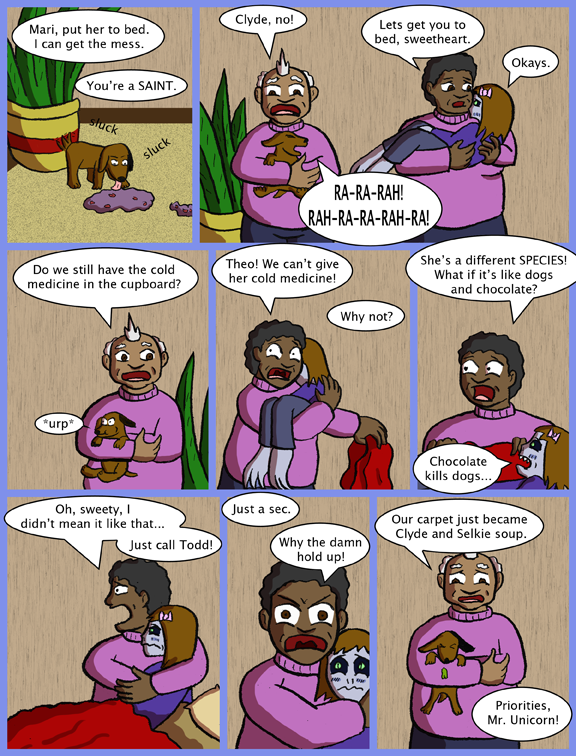 # 86 and 87. https://selkiecomic.com/selkie86/ Grandma didn’t know she was carnivorous, fed her a grape, made her puke and felt terrible. No, see, that was different because… Wizards. Or I just had a brain slip. Either way. That was different because at that point, she didn’t know. Now she DOES know, because it’s as a result of that incident that she was told. Yeah, it was right after Selkie came home and the first time they’d met. Different circumstances. I believe Alpo was referring to the Commentary text, where I mentioned dropping a conceived “Grandma feeds Selkie veggies” story arc… except I actually DID do that earlier, and apparently forgot about it. So today’s Director Commentary is more of a lie than the cake. But if you told a lie and followed it up with cake, wouldn’t that mean you lied twice? Since you know, everyone knows that the cake is a lie. As an owner of a pet with a chronically sensitive stomach, I have to point out that once you have a poor little vomiting creature in your arms (in this case, the second in less than a minute), aiming the vomit to do as little damage as possible simply becomes your instinctual highest priority. Especially if they might not be done yet. Also, it’s less “urp” and more [complaining noise], [louder complaining noise], glk Gh-hlk GH-HLK GHH-HLLLK [vomit splatter]. No, you do not need screaming bird. Perhaps a coffee mug with a heart, or something. You don’t have the repressed rage for a “Screaming Bird”. Ever loose your temper and try to disembowel your own hand? “No,” you say? Well then, I rest my case, … No screaming birds. I can get you a good price on a “warbling wombat” an’ I got a “Mumbling Morose Marmoset,”. Talk to me, work with me, Dave. Here, … What about a “Singing Buff Ferret”? He comes with a Tiger-Print leotard? Again, I’m almost glad she was suspended … I doubt she’d be getting this level of care at school. As for a filler comic, how about the Selkie lapel pin with a voice balloon explaining the circumstances? I think that’d be better than a screaming bird. Smart, Grandma. Selkie does have different biology; who knows what cold medicine would do? …How do underwater colds even work, anyways? On a completely different topic, this is the first time in a long while somebody’s explicitly said Selkie’s a different species. Might her getting sick be leading up to taking her to the hospital to see Dr. Gillman? Sneezing underwater… That would be weird. Wait. 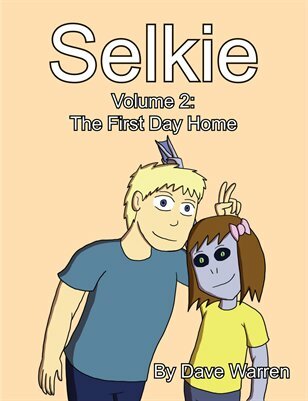 Clyde licked Selkie’s bile. MOUTH RASH. GAH. How could anyone forget Clyde? Love that little wag tail in panel one. Ooh… meat based sick up! Just like Mommy used to make when I was a little puppy!!! Finally these humans are figuring out how to feed a…. HEY! He picked me up!! But I’m EATING! Noooo! My snack! My nice little snack! My… um… um… hey… oh. Oh dear. Ough. Ow…. GLLOOORRPPSHHLLLLUCCCKKKKkkkkkkk……! *dazed* How did that jellyfish disguise itself as a meat sick-up?? I coulda sworn…. your facial expressions just want to make me jump around with joy! the lineart & general comic is drawn cleaner too and youve been getting way better at your shadows. I don’t know what I love more.. reading your comic or looking at it. also the yelling bird comic is hilarious. you need like.. the howling fish or something. This is true. Every Christmas there is a thing in the paper about not feeding your dog chocolate or it will kill it. One year I bought the entire case of World’s Finest Chocolate Bars from the kid at the door, remembering how much I hated doing the “door to door” thing. The next day I come home from work, the cardboard box is on the floor, not the table. My living room rug is covered with white paper and gold foil. Cocker Spaniel, 22 pounds, and ate 24 1 1/2 ounce bars. That, for the math deficient, is 36 ounces, or 2 1/4 pounds. He ate 1/10 his body weight in chocolate. “No, it won’t kill him. He might have the runs. He might be a little hyper for a day or two, but otherwise he should be fine”. It had no effect on him that I noticed. But – 1/10 of his body weight in “deadly-to-dogs poison”. I’ve never worried about feeding my dogs chocolate since then. It depends on the chocolate and the dog breed. Certain types of chocolate contain the unsuitable chemicals more, and certain breeds are more susceptible to it. That’s why they warn everyone about dogs and chocolate, since the deadly combination is difficult to know beforehand. And of course the individual dog, forgot to add that.